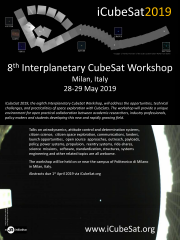 iCubeSat, the Interplanetary CubeSat Workshop, is a neutral, non-profit, open source open access forum for anyone with an interest in the concept of Interplanetary CubeSats to present, disseminate and archive their ideas, work, tools, techniques and other relevant items for anyone interested in the peaceful exploration of space. As such we collect personal data you provide when you register your interest in attending a workshop, submit an abstract to a workshop, upload your presentation and other supporting materials, or contact us. Data collected when you register your interest in attending a workshop may be used to send you further information about how to participate in workshops including paying registration fees, submitting abstracts or otherwise participating. Information supplied by you for making payments such as registration fees are handled by third party payment processors with their own privacy policies which we do not see unless permitted by their privacy policies. If you indicate that you wish your name and contact details to be included on a list of attendees distributed at a workshop then they will be distributed to all attendees of the workshop and others at the venue who may circulate them further. Your name and contact details may also be passed on to third parties to help us deliver the workshop, for example to venue security to give you access to the venue or a local WiFi provider. Data collected when you submit an abstract will be distributed amongst the workshop organisers and reviewers and if selected for presentation at a workshop will be published as widely as possible including on the iCubeSat website, in programs and proceedings distributed at workshops and elsewhere. When submitting a presentation and/or support materials you will be required to permit all the information they contain including any personal data such as author names, affiliations, email addresses, etc. to be published and distributed publically as widely as possible. If you contact us by email or other methods we may keep a copy of your communication and may share it with others including third parties to answer your query and to refer back to in the future.